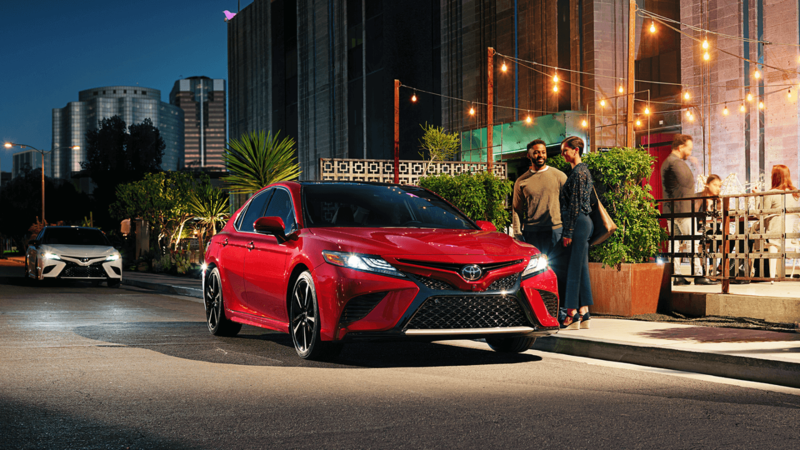 Since it first hit the streets of Atlanta, the all-new 2018 Toyota Camry has been getting attention for its dynamic exterior flare and capable driving dynamics. This new attitude carries over into the cabin as well while never compromising the everyday comfort and practicality that has made this midsize sedan so popular. Check out the 2018 Camry in its many available trims at Marietta Toyota, but first browse some of the interior highlights of the fully redesigned model. Never take your eyes off the road with the HUD, which projects important information onto the windshield, including navigation directions, speed, speed limit, and more! Enjoy superior comfort and style in the front seats with supple leather upholstery and contrast stitching, as well as eight different power adjustable settings. Smyrna drivers can stay comfortable inside the Camry, which is offered with reinforced front and rear seats, as well as vents on the rear seats and heated front seats. The trunk hinges of the new Camry open up wider this year, giving you even easier access to its 14.1 cubic feet of total cargo space. Lots of drivers in Marietta have lately been taking a closer look at the 2018 Toyota Camry, and this sedan’s new allure continues when they step inside. The new Camry is more driver-centric than previous iterations while still following through on its reputation as an accommodating midsize family sedan. On top of the features discussed above, the Camry is also offered with an array of additional creature comforts, including a panoramic roof with a tilt-and-slide moonroof, as well as paddle shifters, dual-zone automatic climate control, push-button start, and a high-tech Entune™ infotainment system. There are a lot of reasons to get excited about the total redesign of the new Toyota Camry, such as the variety of exterior Toyota Camry colors, and you can learn about them all here at Marietta Toyota, located at 750 Cobb Parkway S in Marietta, GA, where we have the 2018 Camry for sale. To see how it compares to the Toyota Corolla, check out our comparison. We’ve been a trusted dealership among Smyrna drivers for over 40 years, due in part to the fact that we’ve been honored with 10 Toyota President’s Awards. Visit us any day of the week, or give us a call at (470) 938-8430 to schedule your test drive.